One summer afternoon in the mid ’90s while sitting around the office, we were discussing the “new” self-propelled peanut combine that Hobbs-Amadas in conjunction with John Deere was developing. We talked about how big and cumbersome it was going to be (six rows) and went on to wish John Deere good luck with this venture. Before the conversation drew to a close, someone mentioned that this wasn’t John Deere’s first taste of self-propelled peanut combines. I am from southwest Georgia, which is arguably the peanut capital of the world, I knew I had not seen or heard of any of these machines. When I was told of the era of this attempt, I quickly knew why I had not heard anything about them. 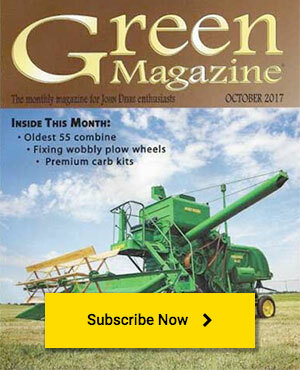 The mid ’60s was when John Deere jumped into the peanut market, and at that time and until this day, John Deere owns the claim to being the only company to produce a completely self propelled peanut combine from scratch to finished product. After hearing all of this, my interest had been triggered and the search was on. The day we discussed the self-propelled combines, a few farmers’ names from the area came up who actually operated these combines. I followed up on this information and learned that most of these combines had been cut up for scrap iron while utilizing the axles for fuel tank trailers. Those very few that we observed which had not yet met the torch were not far from needing that. While talking with the folks who had previously owned or operated them, “dust” was always the main topic. As time went on, I was talking with Billy Ratliff from Plains, Georgia and the 111s came up in the conversation. He said, “Yeah, Luscious Black from down on Kinchafoonee Creek had a couple of those machines.” With that, I did a follow up; sure enough, those two combines were still on the farm and I was allowed to come to visit and inspect them. I went, I saw and we traded. Upon inspection of the two 111s, one under the shed and the other outdoors, it was obvious that in the ’60s this farm maintained their equipment quite well, not saying that they do not follow this standard today. This was the only equipment around the shed at the time of inspection. The one outdoors was delegated for parts and the one under the shed was going to be brought back into service. The day that the combines were retrieved, Frank Bledsoe and I arrived at the shed and met with Buddy Black, Mr. Luscious’ son. As we prepared the truck to load the machines, I kept noticing Buddy looking at the machines and then dropping his head while at the same time shaking it back and forth. I observed this about three times and had to inquire as to what was wrong. 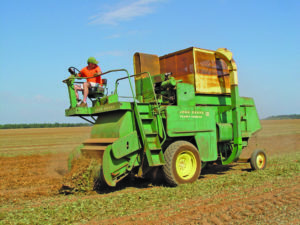 Buddy’s response was, “Back in my college years, I would come home on Fridays during harvesting season and as soon as I arrived, I was directed to operate one of these machines for the weekend.” He went on to say jokingly, “I still have nightmares about my days of running that machine due to the dust. I would go back to school and would still find dirt on me sometimes as late as Wednesday.” We all got a kick out of his memories. We loaded up the machines and headed home. After getting the machines home, the decent one went into the shop and the parts one went on the fence row. After cleaning the decent machine, inspecting it and changing a few belts and bearings, it was time to fire it up. Fresh gas was poured in, new battery was installed and the attempt was made. Initially she kicked and snorted but after some coaxing, she fired up and ran like a new machine. Putting the combine into gear came next. In doing this, I didn’t know what to expect. Was she going to fly apart? How many belts were going to run off? Oh no, I hope she doesn’t lock up. After starting the engine and getting the temperature up, I decided to give it a try. I eased the engagement lever forward and slowly got everything to moving until the lever was all the way forward in its over center position. Comparing it to a half flat tire that had been sitting for 30 some odd years, there were a lot of flat spots on the numerous belts. She sat there at full throttle and rocked back and forth as if she wanted to go to the field right then. I walked around her while the machine was running and looked her over—everything appeared to be operating normal. I decided it was time to see if she could move around with all of the other stuff moving inside her at the same time. I eased her into gear while still wide open and here we went. She ran flawlessly. All we needed were some peanuts ripe for the picking. We put her up until then. 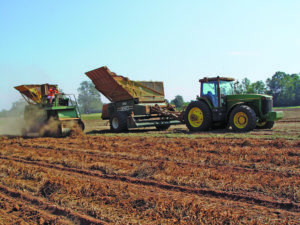 The 1997 peanut harvest season rolled around and as luck would have it, 270+/- acres of freshly inverted peanuts laid in wait just out the front door of the shed that the 111 was stored in. It was time to try her out. She was brought out, cleaned up and serviced for the so-called field trial. Here she stood among a six-row KMC as well as a six-row Hobbs-Amadas towed combine. It was time to give her a try. Mid-morningg passed through, opening up to clear skies with low humidity that allowed the peanuts to dry out, which is very beneficial to her operation. All of the other guys looked at this venture on my part as a novelty and laughed and joked about it, but I looked upon it as a challenge—taking a 30-something year old piece of machinery and allowing it to do what it was designed to do (pick peanuts) under its own power. At the start of picking that day, she held her own. She maintained her speed across the field matching that of the two six rows that everyone just knew were going to walk off and leave her. Yes, as the day grew warmer and the peanuts dried out more, the bigger machines did gain a little ground. But, pound for pound, the 111 held her ground. Dust? Here is where I remembered dust being the main topic of everyone’s discussion related to the 111s. There was enough dust to go around for everybody. I was picking down one row and an elderly gentleman from town had come out to watch; he even brought a six pack of soda with him. He saw how dusty it was—he walked towards me on the row I was picking and it was so dusty I could barely see him. Don’t worry, I was about 100 yards from the end and he set the six pack down in the row about 50 yards out and retreated. He did not want any part of the dust. I stopped long enough to grab the sodas and I believe I had consumed four of them before reaching the end, picking two ton peanuts. That’s right—two ton peanuts. She worked real well for her return to the field in 30-something years. She picked about seven baskets, was cleaned up, serviced again and placed back into the shed. Again, to some this may have seemed as a novelty—so be it. It was obvious that we were not going to harvest the 1997 crop with her, rather just exercise her a little bit. And luckily it went off without a hitch. 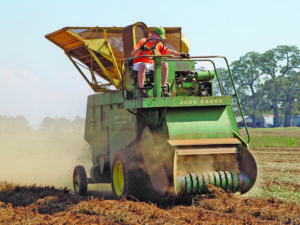 After all of the research that I conducted related to this machine and the discussions held with current growers of peanuts and former operators of the 111, it is my opinion that this was a well engineered machine with basically no flaws for the time period of production. The two main drawbacks I see that were major contributing factors to the demise of the 111 were not the machine itself but rather indirect factors such as 1) weed control: I hear stories about operators pulling up to the end of the row and engaging the combine and locking the brakes. The peanuts had so many morning glories in them that the weeds would walk to the combine with the entangled peanuts in tow and when all of these green vines gathered up inside the combine, it made for a long day with hopefully a sharp knife. Proper herbicides such as those we have today had not been developed back then. 2) The other problem that I noticed was the way the peanuts were prepared for harvesting. They were not inverted or dug up and turned over to allow for quicker drying to allow for the machine to receive them better for stripping the nuts from the vines. They were dug up and in doing this, the digger with two plow points eased under the peanuts and lifted them just enough to allow the lift chains to carry them about three feet to the rear and just drop them back onto the ground. This slowed the drying process and caused the stripper teeth in the combine to work overtime in the stripping drums. There are still a few of these machines around. If John Deere had stuck it out a little while longer, I feel that there would be quite a few more around but sometimes that’s the way the ball bounces. Please note that these machines were built before I was born, but I have had a heck of blast with this adventure.